The DEKA Arm System or 'Luke'. US defence agency DARPA has invented a new kind of robotic prosthetic limb that it says can give the wearer the sensation of touch again. Thanks to a connection straight into the brain, the paralysed patient in question has been given back the ability to actually feel objects around him. It's a significant step forward for the technology and for prosthetics, enabling patients to not only pass down commands to an artificial limb but to actually get some natural sensation back in return. This can make interactions much more precise. Built in partnership with the Applied Physics Laboratory at John Hopkins University, the attachment has been affectionately called Luke (after Luke Skywalker). Its official name is the DEKA Arm System. "We've completed the circuit," said DARPA program manager Justin Sanchez in a press statement. "Prosthetic limbs that can be controlled by thoughts are showing great promise, but without feedback from signals travelling back to the brain it can be difficult to achieve the level of control needed to perform precise movements." 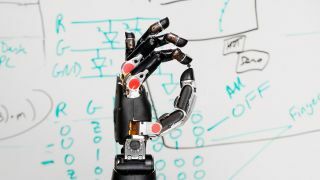 "By wiring a sense of touch from a mechanical hand directly into the brain, this work shows the potential for seamless bio-technological restoration of near-natural function," adds Sanchez. The volunteer involved in the testing, who has been paralysed for more than a decade after a spinal cord injury, was able to detect with nearly 100 percent accuracy which of his robotic fingers were being touched by researchers. Further trials are expected in the near future.